Disability Rights Nebraska helped unearth the problems at the Beatrice State Developmental Center (BSDC), which gave rise to the creation of the Developmental Disabilities Special Investigative Committee (DDSIC). Given the systemic nature of the issues identified in LR 32, the reports from the Department of Justice as well as the Special Investigative Committee itself, constant and vigilant public attention is required. The Developmental Disabilities Special Investigative Committee has been instrumental in raising issues beyond those initially identified by Disability Rights Nebraska and the United States Department of Justice. The Special Investigative Committee also has been crucial in developing solutions to these issues and holding officials accountable for implementing them. We believe that if the recommendations stemming from the Developmental Disabilities Special Investigative Committee report are to be fully implemented, continued oversight by the committee proposed in LR 32 is crucial. 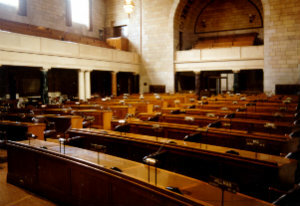 LR 32 advanced and was adopted by the Legislature.